The audio teaser of the first single from Thalapathy Vijay's Mersal, Aalaporan Tamizhan released at 12.00AM this morning, which became instantly viral over the social media. Now, the song teaser video has crossed over 1.5 million views in just 12 hours, half a day. The film's production house, Thenandal Studios Limited confirmed this through their tweet, "Mersalaana 1.5 million views on YouTube in just 12 hours! Craziest fan love for #Mersal! 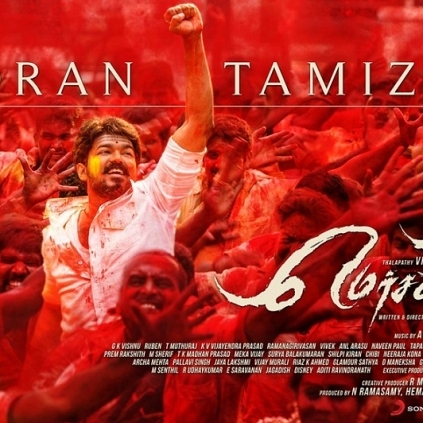 #AalaporanTamizhan"
Aalaporan Tamizhan, which has music by A.R.Rahman and lyrics by Vivek, is sung by Kailash Kher, Sathya Prakash, Deepak and Pooja A.V. Get ready to listen to the full song today at 5 pm. People looking for online information on AR Rahman, Atlee, Mersal, Vijay will find this news story useful.